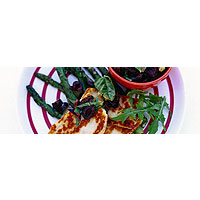 This starter combines the deliciously sweet, succulent flavour of asparagus with the salty, sharp tang of grilled Halloumi and lemon and olive salsa. Always use fatter asparagus spears when barbecuing, as it makes it far easier to turn them. Start by making the salsa. Peel and segment 1½ lemons, roughly chop the flesh and combine it with the olives and basil. Whisk together the juice from the remaining lemon half with the oil and honey and season. Add to the lemon mix and set aside. Place the asparagus spears in a large bowl, toss with the oil and season. Cook the asparagus on a preheated barbecue for 4–6 minutes, turning halfway through – it should be lightly charred and tender. Transfer to a large platter. Preheat a heavy-based frying pan (you can place the pan on your barbecue to heat it up) and sear the Halloumi for 30 seconds on each side, until golden. Arrange over the asparagus and top with the rocket leaves and the salsa. Serve immediately. The vegetal edge of the asparagus and the saltiness of the Halloumi both excel with Sauvignon-like dry whites.